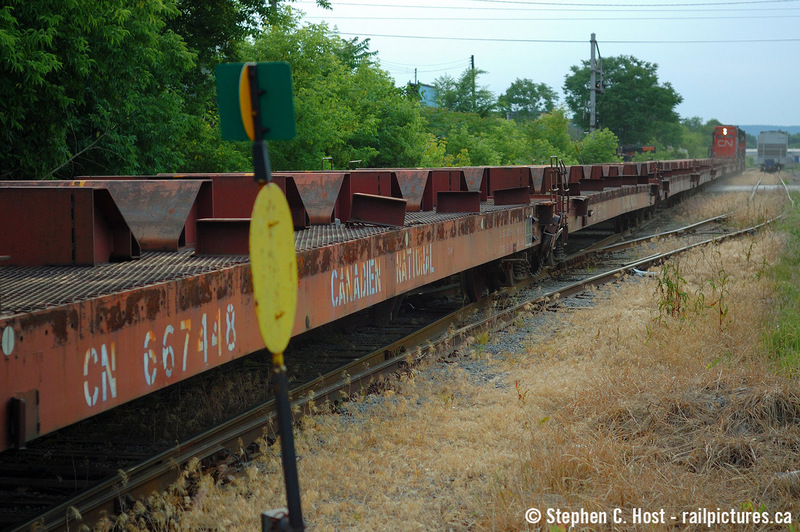 Railpictures.ca - Stephen C. Host Photo: I rarely do going away shots of trains, but this one spoke to me. Rust coloured everything, appropriate for the service this train is in, showing details of these steel train cars perfect for the modeller types. CN 4725′s headlight is easily seen through the empty cars approaching Victoria Ave in ever gritty Hamilton. | Railpictures.ca – Canadian Railway Photography – photographie ferroviaire Canadienne. Caption: I rarely do going away shots of trains, but this one spoke to me. Rust coloured everything, appropriate for the service this train is in, showing details of these steel train cars perfect for the modeller types. CN 4725's headlight is easily seen through the empty cars approaching Victoria Ave in ever gritty Hamilton. Hi Steve. Do you have a shot of these cars loaded? Many thanks in advance.